I want to show the temperature data with Teraterm . I get from PMOD TMP3 . But I have to design the PMOD TMP3 IP and I do not know what is the difference with led_ip_design on the link there. Can you help me? How can I show the temperature data? What board are you using as a host for your pmod? Well then ... at this point I would need to wait for someone else on the forum (@jpeyron perhaps?) to answer your question: I don't have any zynq boards, zybo or otherwise, nor do I have any experience with getting software up and running on them. Had you needed a simple I2C controller, I would've pointed you to this one that I just recently put together. Had you needed a simple UART controller to "talk" to teraterm, I would've pointed you at this one. Indeed, if you were trying to do this from a chipkit board, I might've tried working the project with you as I have a ChipKit WF32 on my desk. But ... zynq is still a touch beyond my current background. Using Google, I did find this thread that might offer some insight. Perhaps that will help you? Thanks for your answer @D@n .
3) select it and in result you should see that a change of the port icon indicating that the port is connected. I am not sure what is wrong with the clock connection. Did you use auto connection tool? 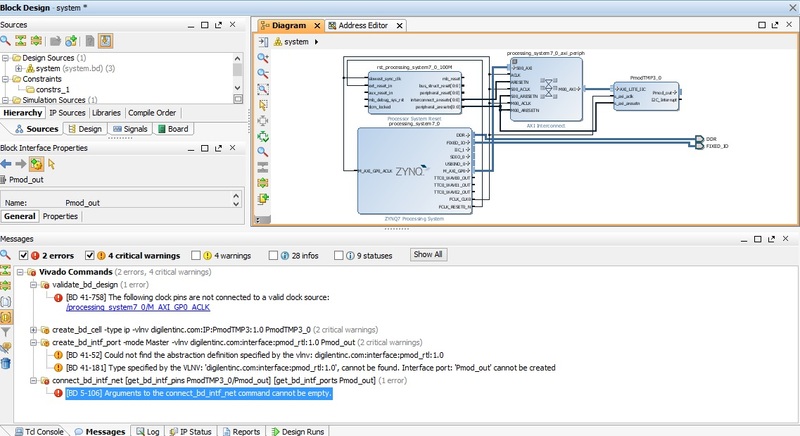 I have not gone through the xilinx tutorial you linked but looking at your design you should only need to drag the pmod port when selecting boards to the pmodout of the PmodTMP3. We are in the process of updating our Using Pmod IP tutorial here. I would go suggest to go through the getting started with Zynq tutorial that is on our resource page here as well. Once you connect the pmod port to the pmodout then validate the design, create a wrapper with vivado's managing. Next generate a bitstream. Then you export hardware w/bitstream and launched SDK. In SDK create an new application using the hello world template. Next i copy the contents from the main.c in the examples folder found in the vivado library folder in your computer (path: vivado-library-master\ip\Pmods\PmodTMP3_v1_0\drivers\PmodTMP3_v1_0\examples) and past of the contents in the helloworld.c file under src in the application. You next program the board and launch hardware(system debugger). You data should now be showing in teraterm. Remember the baud rate should be set to 115200. 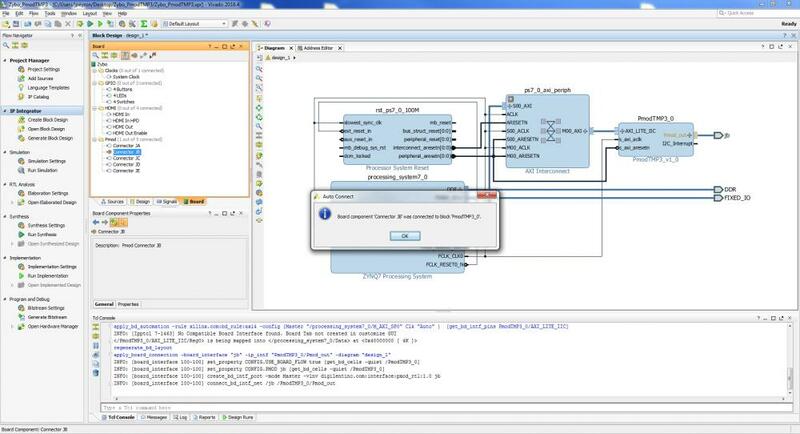 I have attached a screen shot and my completed but not tested project using the PmodTMP3, Zybo with vivado 2016.4.